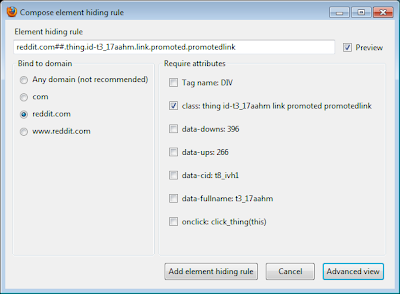 Reddit recently introduced an update to their ads which eludes AdBlock Plus. Instead of a simple element ID denoted as a sponsored link, their page uniquely identifies it according to a link to the comments for a given ad posting. Ads annoy me, and as my previous post on blocking Reddit ads attests, even their minimal advertising is an unwanted distraction. If you want a more detailed procedure which might help you block other unwanted web content, read on. 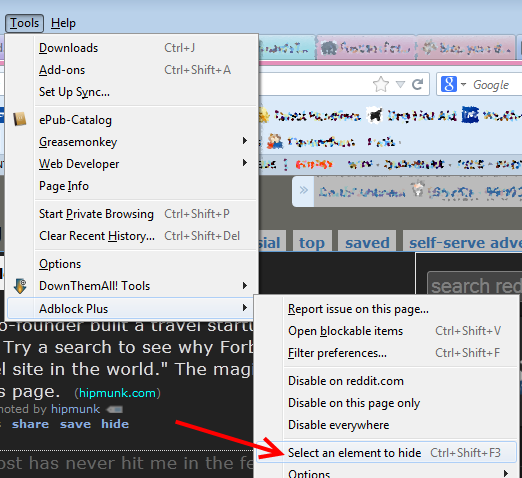 In Firefox, tap the ALT key to display the menu, then click Tools => AdBlock Plus => Select an element to hide (or alternatively hit CTRL-SHIFT-F3). This brings up the element selection dialog that lets you pick and choose items on the web page to hide. 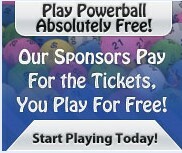 Note the entire ad post is surrounded, with a tag in the lower-left indicating the post is within a DIV element. 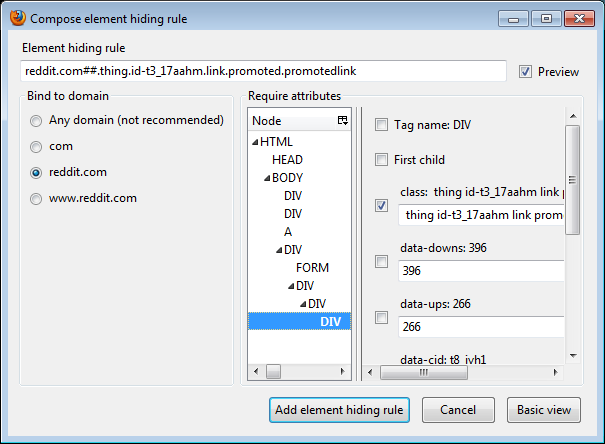 Click on the tag for this area, and you'll open the Compose element hiding rule dialog. This is the Basic view, but we need to go deeper, so click on the Advanced view button. By default, when you clicked to select the ad, the element hider chose that specific DIV element. However, blocking this won't do, as each ad will have a unique identifier (in this case, 17aahm) which will foil the filter. To get around this, first click on the checkbox beside the option that begins "class: thing id-..." to uncheck it, and then click on the DIV in the list which is the parent to this one, just above the default selection. 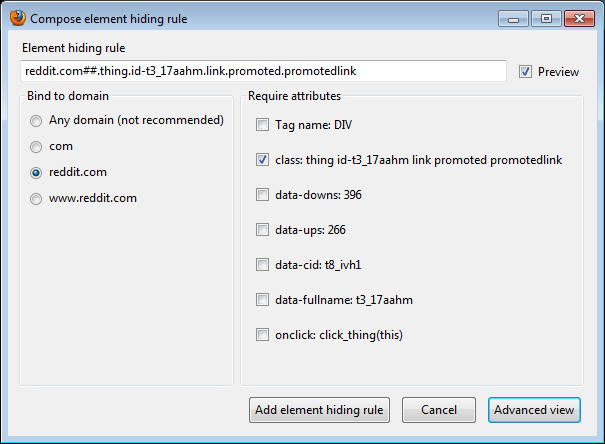 Then, click the checkbox beside siteTable_promoted so that it's checked, and then click the Add element hiding rule button. Now the ad should be hidden, either immediately or after your next refresh of Reddit's page.